Gombe United winger, Abubakar Musa is recuperating well after he underwent a successful surgery, Sportinglife.ng has been informed. The former Heartland player ruptured his Achilles tendon during a training session last month and went under the knife at Trinity Orthopedic in Kano. 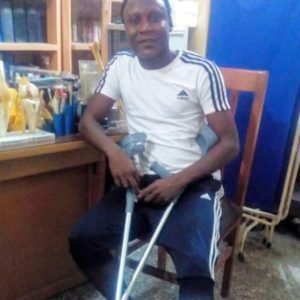 The Media Officer of the club, Halilu Mohammed Teli told Sportinglife.ng that Musa, who now moves about with the aid of crutches, is making a steady recovery and may return earlier than expected. “The doctor said he will be out of action for six weeks when he had the surgery two weeks ago. It was during one of our training session around 11th of January that he sustained the injury. So in the next four weeks he is expected to start light training. But with the rate at which he is responding to treatment, he may even return to action sooner than expected. “Even though he hasn’t played any match this season, the players are really missing him. He is the kind of player that relates well with his teammates. “It is the club that takes care of the financial burden for the operation and his treatment so far. The management believes it is their responsibility to take care of the player and that is what they are doing,” Teli told Sportinglife.ng.